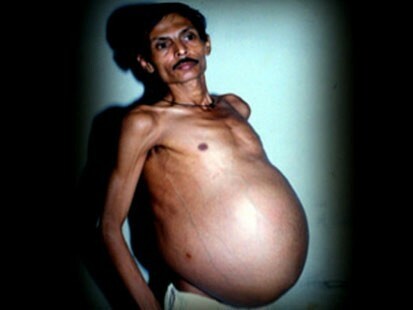 Sanju Bhagat had felt self-conscious his whole life about his big belly. His stomach was often so swollen, he looked nine months pregnant and could barely breathe. But one night in June 1999, Bhagat’s problem erupted into something much larger and far freakier. That night, Bhagat who lived in the city of Nagpur, in India, his stomach pain became unbearable. An ambulance rushed the 36-year-old farmer to the hospital. Dr Mehta, thinking he might have a giant tumor in his stomach, decided to operate. Dr Mehta said that he can usually spot a tumor just after he begins an operation. But while operating on Bhagat, Dr Mehta saw something he had never encountered. As he cut deeper into Bhagat’s stomach, gallons of fluid spilled out — and then something extraordinary happened. “First, one limb came out, then another limb came out. Then some part of genitalia, then some part of hair, some limbs, jaws, limbs, hair,” says Dr Mehta. At first glance, it may look as if Bhagat had given birth. Actually, Mehta had removed the mutated body of Bhagat’s twin brother from his stomach. Bhagat, they discovered, had one of the world’s most bizarre medical conditions — fetus in fetu. It is an extremely rare abnormality that occurs when a fetus gets trapped inside its twin. The trapped fetus can survive as a parasite even past birth by forming an umbilical cordlike structure that leaches its twin’s blood supply until it grows so large that it starts to harm the host, at which point doctors usually intervene. There was no placenta inside Bhagat — the enveloped parasitic twin had connected directly to Bhagat’s blood supply. Right after the surgery, Bhagat’s pain and inability to breathe disappeared and he recovered immediately. The case may have been a medical miracle to doctors, but to Bhagat his condition had been a source of shame and misery. All his life, people in the village where he lived had mercilessly teased him and told him he looked pregnant. Ironically, they were right in a way. Today Bhagat is in good health and leads a normal life, but he still gets teased occasionally. “They still ridicule him. What they say is, you went for an operation and you had the baby,” Mehta said. 2 limb in his stomach. God can do any thing. Yes this is an abnormal case. This is a miracle of god. This is really very painful.